AWESOME 0.53 Carats (over 1/2ct) Round Brilliant Cut G-H, Near Colourless. 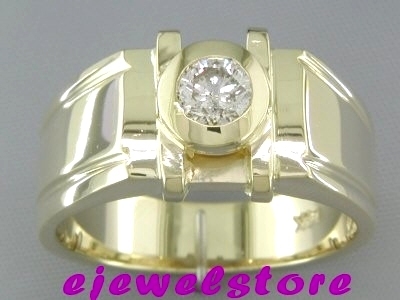 SI3/I1, near eye clean Genuine Diamond set in 14ct Yellow Gold (Heavy Gold weight 13.6 Grams). Fantastic bezel set design! A Stunning Ring! 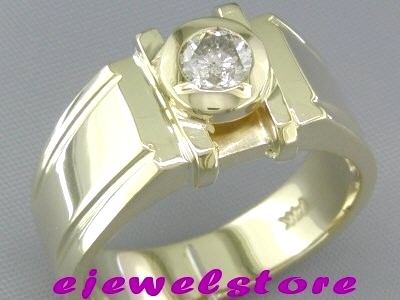 This is ring would suit someone with a sense of Real Style. Please note that the Diamond is Real, it is not man made or Lab Created or enhanced in any way. Appraised Value: $6580.